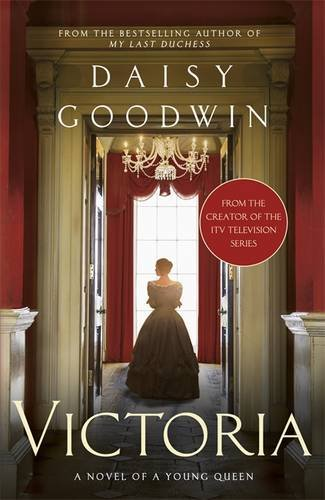 Ahead of this Sunday's upcoming premiere of Victoria on Masterpiece here in the United States, I ordered a copy of Daisy Goodwin's companion novel. I've really enjoyed Goodwin's novels in the past, so I had high hopes for this one -- but, unfortunately, it didn't quite live up to my expectations. Goodwin is the screenwriter for the Victoria series, and she notes in the book's acknowledgments that she wrote the novel as she was writing the screenplay for the series. This makes a lot of sense to me, because at times, the book feels a lot like a novelization, broken up cinematically into scenes and moments rather than following a more novelistic structure. The book is also full of exposition, and there were many times that I wanted Goodwin to use a subtler hand and "show" us what was happening rather than "telling." This isn't a problem exclusive to this book -- lots of historical fiction has trouble balancing the fascinating historical source material and with the plotting and characterization of a novel. But the book "explains" the situation often when it would be more exciting to simply lay the scene and let it happen. Goodwin clearly doesn't want the reader to get lost in the historical references, but she also doesn't really trust readers to understand the history on their own. For me, the last problem of the book was the focus on romance over all other parts of Victoria's early life. (I fully expect that to be a problem with the miniseries, too, given some earlier reviews I've read.) I thought the book was most interesting when it was exploring Victoria's relationship with her mother and her burgeoning interests in the politics of visibility as monarch. But the book spends much more time developing a romantic relationship between Victoria and her prime minister, Lord Melbourne, and then exploring the beginnings of the relationship between Victoria and Albert. I think the bottom line is probably this: if you like learning about history through fiction (and lots of people do! ), this may be something you'd be interested in, especially if you're not particularly versed in the details of Victoria's life. But get ready for lots of emphasis on Victoria's feelings for the men in her life (and an attempt to turn Lord Melbourne into a Byronic hero) and a little fast-and-loose playing with historical fact. I think you also might like it if you've already seen the miniseries and you're looking for something to tide yourself over until the new season debuts. Honestly, though, my recommendation is to skip Victoria and turn to one of Goodwin's earlier novels. I really enjoyed The American Heiress, which is loosely based on the life of Consuelo Vanderbilt. For those who want more on Queen Victoria's life, I'd nudge you in the direction of Julia Baird's recent biography instead. Note: The links in this post are Amazon affiliate links, and I receive a small portion of the proceeds if you make a purchase through any of the links. I purchased this book using the proceeds from those Amazon sales; I use all of the funds to buy more materials for review here at the blog.